Bringing your new baby home is a special event. And over the next 6 months, you’ll have many more milestones in your baby’s development to treasure. From that first smile to that first spoonful, this section tells you what you can expect and what to look forward to. Now that you can change nappies with your eyes closed and have mastered the first stage of weaning, discover what’s coming up over the next few months in your baby’s development. From exploring the world on all fours and making those first words, to taking on life as a toddler. Congratulations! Your baby has reached his first birthday and you’ve had an amazing year, growing, learning and enjoying all those baby milestones together – which might even include baby’s first steps. It’s probably difficult to believe that your active, noisy 12 month old baby was a tiny newborn, not that long ago! Let’s look at what other milestones your baby might reach in month 12 – besides that exciting first birthday party! Don’t forget that all babies develop at their own pace. If you have any concerns about your one year old’s development, be sure to mention it at their one year health check. The average baby’s weight will have tripled since birth, and they’ll have grown by 50% in length. This growth and weight gain will slow significantly in your baby’s second year, as they become more active and are drinking less milk – they may only gain around 2.3kg and grow by 10–12 cm. Your baby will have done lots of growing on the inside too, and their brain will now be about 60% of its adult size. It’s growing more rapidly now than at any other time in their life, so encourage good brain development by continuing to read, talk to and play with your baby as much as possible. Your baby can now have honey and peanut butter, and should be able to join in with family mealtimes more (always be vigilant to any signs of allergic reactions). There are still many foods that baby can’t have, however. Unsuitable 12 month baby food examples include choking hazards and unhealthy foods such as whole grapes, food in large chunks, nuts, seeds, raw vegetables, hard or crunchy foods like popcorn, sticky foods like dried fruit, marshmallows and candies, salt, sugar, low fat foods or foods that are high in saturated fats such as crisps, biscuits and cakes. A one year old baby will be ready for a health check with your doctor or healthcare professional. They’ll also be due to have several vaccinations including the MMR (measles, mumps and rubella), which your doctor can advise on. You should also consider making that first dentist appointment, if you haven’t already. The American Dental Association recommends a first dental visit no later than a child’s first birthday. Most babies still need at least one nap a day, but you might find them starting to resist naps or bedtime as they become more engaged with what’s going on around them. Following a good sleep-time routine should help – a story before daytime naps, and a story, soft music and bath before bedtime, for example. Most 12 month old babies will be sitting and standing unaided, and bending from a standing position. Half will have taken those first steps and a few will be able to walk well – although don’t be surprised if you still see your baby crawling for quickness! If your baby is walking well enough to think about walking outside, it’s time to get them fitted for their first pair of proper shoes. Beware that climbing may now become an appealing activity for your baby – whether that’s climbing stairs, climbing up on the furniture or trying to climb out of their cot. Make sure you have stair-gates in place and drop your baby’s mattress lower if you need to. When it comes to their hand and finger motor skills, baby is getting stronger and more dexterous every day. A few babies will now be able to hold and scribble with a crayon. You might also find your baby attempting to remove a lid from a jar – baby locks on cupboards are a good idea! While playing, your baby should be able to give you a toy, or take one from you. He might also enjoy putting objects inside other objects – such as blocks into containers – then tipping them all out again! Your baby will now be capable of increasingly complex thought processes. Their memory is getting better and they may be able to remember where they last saw a particular toy. Half of all 12 month old babies will be able to understand and respond to simple instructions, and most can indicate their own wants with gestures such as pointing. They’ll be busy practicing their language skills every day – often by repeating the same sounds over and over. Most babies will be jabbering at this stage, half will be saying one word besides ‘mama’ and ‘dada’, and a few will be saying two other words. 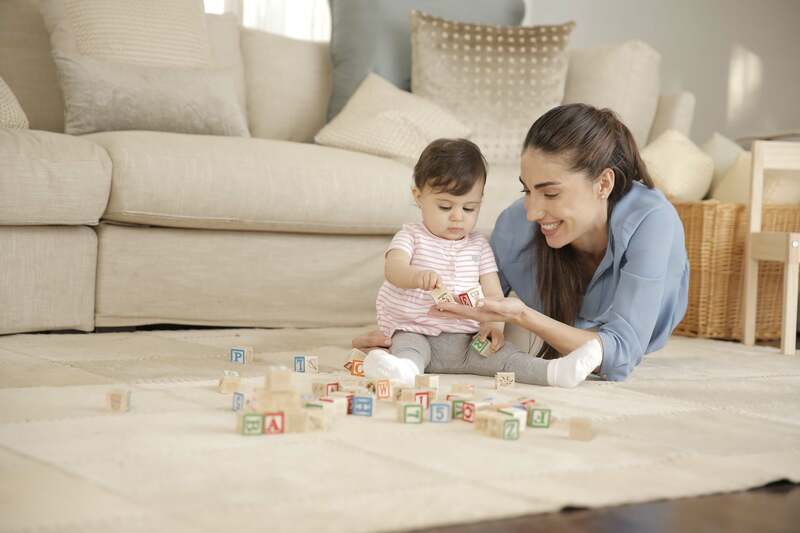 Help your baby make the connections between objects and their names, and develop his vocabulary, by saying the names of the things he can see. A typical one year old loves exploring and learning through play, so provide him with lots of opportunities to develop his senses. One idea is to fill a box or a clear container with lots of different items that have different textures and make different sounds. Choose a combination of brightly colored, patterned or even shiny items, to develop baby’s sense of sight, hearing and touch in one fun game. Your baby is likely to become more social as their understanding of language develops, and they may enjoy being around other children in a playgroup or activity setting. It’s likely that they will still want you close-by, however, as they may still be shy and anxious around strangers to begin with. As your baby moves into the toddler stage, they’re likely to begin testing your boundaries, throwing tantrums and watching for your reactions to certain behaviors. Try to avoid giving your baby attention for bad behavior. Focus on rewarding and encouraging good behavior, and be consistent in giving a firm ‘no’ to the behavior that you don’t want. You’re also likely to see your baby’s own unique personality shining through more as they leave their first year behind. As their sense of humor develops, you might even find yourself with a little comedian on your hands!